other themes are affected too. 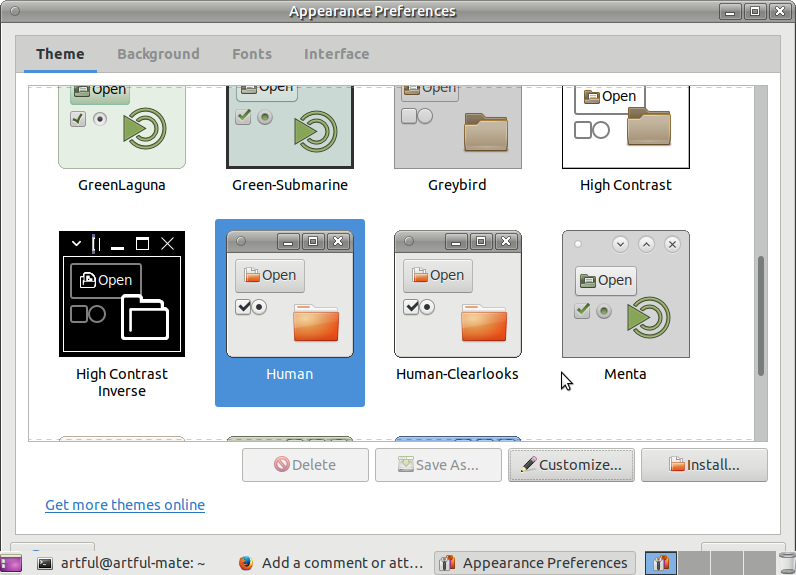 You can see grey/silver window title in Human and Human-Clearlooks themes in attached screenshot. 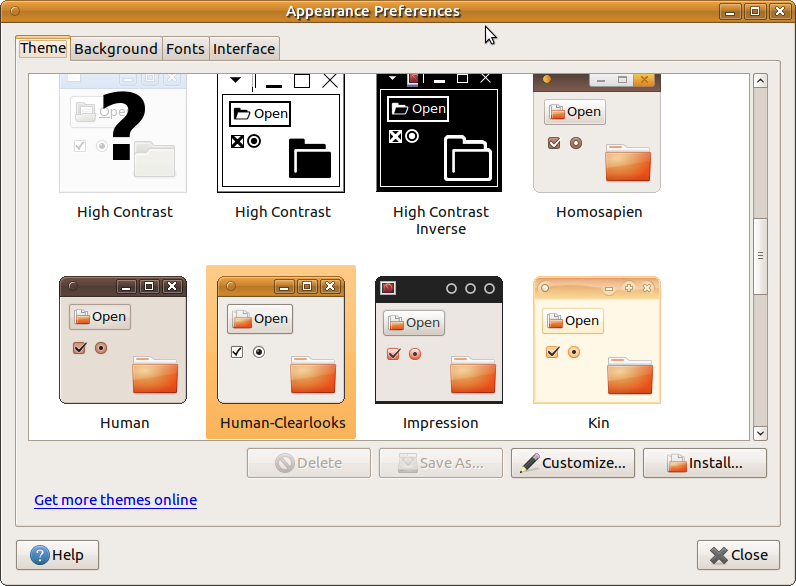 Correct colors of Human-Clearlooks theme in Xenial MATE are shown on screenshot. Bug exists in Ubuntu 17.10 MATE final. I got this bug on Ubuntu 16.04 LTS MATE while switched to the Compiz in mate-tweak. Human theme is has gray instead of orange. 18.04 with all updates, bug is here. 18.04 LTS with all updates, bug exists. This bug boggles my mind. Looking at the human-theme Launchpad code page https://code.launchpad.net/~ubuntu-art-pkg/human-theme/ubuntu it looks like the code for the Human theme packages hasn’t been updated since 2011. Why would it stop working now?! Maybe a bug needs to be filed with GTK? My hunch is that this has to do with how the Human themes have theme definitions for GTK2 but not GTK3—other themes like this seem to be having similar problems, now. The best workaround I’ve found is this one: https://www.opendesktop.org/s/mate/p/1013593/ It took a little bit of fidgeting for me to get this to work correctly, and there are still some bugs, but someone has created workable new versions of the Human themes. Personally, I used the “Human Quarny Clearlooks” theme, by copying its folder (renaming it “Human-Quarny-Clearlooks”) into “~/.themes”, then copying the “metacity-1” folder from “Human Quarny” into “Human-Quarny-Clearlooks”, and updating the index.theme file to rename the theme “Human Quarny Clearlooks” and then specify the sub-themes (except for icon theme, which stays “Humanity”) as “Human-Quarny-Clearlooks” instead of just “Human”). …That was way too complicated, but just copying the theme folders into “~.themes” created four or so different “Human” themes in the “Appearance” theme selector, and I had a feeling that madness lied that way. I'll try your complicated method, you can participate in discussion on MATE Community - https://ubuntu-mate.community/t/problems-with-gtk2-themes-such-as-human-theme-on-ubuntu-18-04-lts-mate-poll/16516 . Still a problem for Ubuntu MATE 19.04 beta2. Really it was started to appear with 16.10, so all 16.10, 17.04, 17.10, 18.04 LTS, 18.10 and 19.04 are affected.